Today's static fire test paves the way for a planned April 9 launch for the huge rocket. SpaceX's Falcon Heavy launches on its first-ever flight, a Feb. 6, 2018, test mission. The rocket's second launch is scheduled for April 9. CAPE CANAVERAL, Fla. — The second flight of the most powerful rocket in operation is just days away. SpaceX is targeting Tuesday (April 9) for the next flight of its megarocket, the Falcon Heavy. Essentially three Falcon 9 boosters strapped together, the behemoth will lift off from historic Pad 39A here at NASA's Kennedy Space Center. This afternoon (April 5), a shiny new Falcon Heavy roared to life, as smoke billowed from its engines during a preflight test. The brief ignition, known as a static fire test, is one of the last major milestones in launch preparations, ensuring that all systems are working properly and that the rocket is ready to fly. The highly anticipated test — originally estimated to take place on April 1 — appeared to go off without a hitch. Not long after the rocket's engines shut down, SpaceX tweeted that the launch would happen as early as Tuesday. So, Falcon Heavy seems set to fly for the first time since its maiden voyage in February 2018. Related: In Photos: SpaceX's 1st Falcon Heavy Rocket Test Launch Success! Falcon Heavy is the most powerful rocket flying today, but it has only one spaceflight under its belt so far. The reusable rocket first launched on Feb. 6, 2018, ferrying Elon Musk's cherry-red Tesla Roadster — "driven" by a spacesuit-wearing dummy named Starman — into orbit. The nearly flawless first launch, which included successful landings by two of the Falcon Heavy's three first-stage boosters, earned SpaceX major accolades, including coveted military launch contracts. 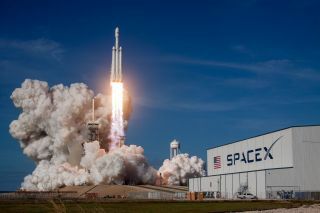 Fetching a price between $90 million and $150 million per launch, Falcon Heavy has already been certified by the U.S. Air Force to fly national security payloads. SpaceX has even snagged a military mission for the rocket — a $130 million deal to launch an Air Force Space Command satellite. The black-and-white colossus combines three Falcon 9 first stages to form one 27-engine megarocket. Last May, just months after Falcon Heavy’s debut, SpaceX made a long-awaited transition to a more capable version of the Falcon 9. The souped-up Falcon 9, dubbed the Block 5, packs a much bigger punch: 1.8 million lbs. of thrust. According to Musk, that means that the Falcon Heavy that flies next week could feature more than 5 million lbs. of thrust — roughly a 10% increase over last year's demonstration flight. Onlookers got a taste of that increased performance today as the rocket’s 27 first-stage engines fired in unison for a few seconds. In addition to the added thrust, the Block 5 Falcon 9 features myriad upgrades designed to facilitate reusability. Previous versions of the Falcon 9 were designed to only fly two to three times; the Block 5 is capable of flying as many as 10 times with little to no refurbishment in between flights, Musk has said. Falcon Heavy is expected to launch at 6:36 p.m. EDT (2236 GMT) on Tuesday. If all goes according to plan, the two side boosters will touch down in unison on their designated landing pad at Cape Canaveral Air Force Station, while the central booster will land at sea, on one of the company’s two drone ships.